Formative years are critical years, and elementary school teachers are important influencers on children during this time. Elementary educators are critical to setting children on the right path for success. In addition to teaching, they nurture students and support their emotional growth, providing them with the strong foundation on which to build a successful educational path. They leave long-lasting, positive impressions that transcend the classroom. 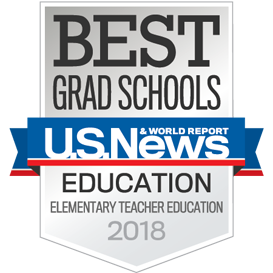 You can learn the skills for this important career at the 6th-ranked Elementary Education program in the country. Teaching offers more than an enriching and fulfilling career, it also offers stability. In the US good teachers are in high demand. US News reports that over 116,000 new elementary education jobs will be added to the market by 2022. Teach Virginia names Elementary Education as the second hardest for which to find qualified teachers. Fortunately, Curry School teacher education graduates enjoy a 100% job placement rate. Our Curriculum & Instruction graduates also have ample job opportunities. They have become instructional coordinators or curriculum specialists, gone into government to improve educational policy, pursued careers in academia and research, and joined museums. Many of the career outcomes are dependent on what type of degree you receive. Let us help you find the right option at Curry. Do you want to be an elementary school teacher working with kindergartners, 6th graders, or any grade in between? The Curry School offers a Master of Teaching (MT) degree with licensure and endorsement in Elementary Education. We offer two programs: the B/MT (Five-year Program for Undergraduates) and the PG/MT (post-graduate program for those who have already completed an undergraduate degree). Earning an Ed.D. in Curriculum & Instruction prepares you for employment as a curriculum specialist, faculty member, or educational consultant to develop policies related to curriculum and the education of professionals. You can also select an optional area of emphasis in English Education, Gifted Education, Mathematics Education, Science Education, Social Studies Education and Instructional Technology.